During the tournament's main days, a masseuse was on hand to ease the tension of many a player who needed relaxing. This young lady is also Peter Jepsen's other half, and she was asked to share in the limelight after Peter had won the tournament. Farid moved all in pre-flop with . Peter didn't need any thinking time when he saw for his pocket cards, he instantly called. Peter takes a huge lead, but Farid has a straight draw! Turn: - more outs for Farid. Any 8 or 3 can win it for him. 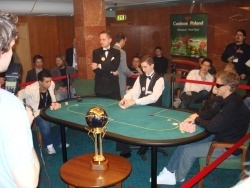 Jepsen jumps to his feet as the first EPT Warsaw champion. 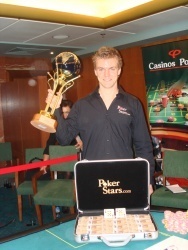 Peter Jepsen holds the EPT Warsaw trophy. Handsome EPT Trophy and lovely lolly! A happy winner with his money and the pair of 7's that hit the flop for a set. 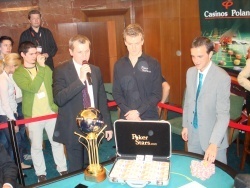 Peter Jepsen takes home EUR 325,633 (1,266,711 PLN) and the EPT title. Farid Meraghni receives EUR 182,063 (708,225 PLN) for his second place finish. This game is a very static stalemate right now. The media are getting restless. 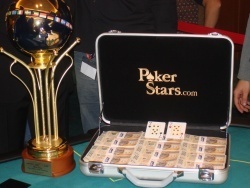 After four days of great poker everybody expected fireworks here tonight. That hasn't been the case. Both players have an almost equal 1,400,000 chips. The pots are rarely over 150,000 at this stage. Small pots continue to be exchanged. Who will grab this game by the scruff of the neck?